Dell Small Business coupon code deals are for discounts on small biz laptops, desktops, workstations, servers, software, networking gear, and more. 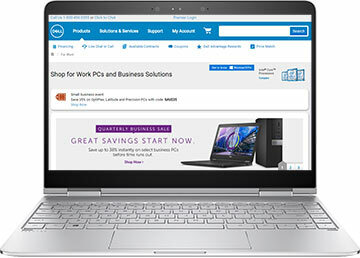 They’re not good in the home store, but Dell Small Business coupons can provide discount prices, cheap deals, and/or free shipping on Latitude laptops, Precision Workstations, Vostro computers, PowerEdge servers, and more. We geeks often pride ourselves on our entrepreneurship skills. It doesn’t matter if you are the only employee in your sole-proprietorship or if you own a small or medium business: Dell Small Business has a solution or product for you. They know about business, too, because it’s one of the largest technological corporations in the world, with tens of thousands of employees in the United States alone. Perhaps you’re looking to outfit your home office with a Vostro laptop, a Dell Precision Mobile Workstation, or a Latitude Laptop. Or maybe you need something bigger, such as an Optiplex desktop, and all-in-one desktop, or an Inspirion, Studio XPS, Dimension, or Vostro desktop. You can go smaller, too, with tablet PCs and mobile devices such as the Mobile Streak or Latitutde XT2. It’s possible you’ve got all of the major computer equipment you need, but you could still use the latest server (choose from blade, PowerEdge, rack, or tower), storage device, networking gadget, driver, printer (laser, color, monochrome, color LED laser), or monitor. Get great deals on ink and toner too. Techies are always looking for new parts, so if it’s just improvements you need, at www.dell.com/us/business/p/ you’ll find savings on parts and upgrades for your Dell laptop (Adamo, Alienware, Inspirion, Latitutde, Precision, Studio, Vostro, or XPS) or Dell desktop. Dell sells its own brand, but it also stocks many other brands of computer parts and accessories, including ADS Technologies, Asus, ATI, Barracuda Networks, Case Logic, Hewlett Packard, Logitech, Mobile Edge, Netgear, Panasonic, Quantum, and Zebra Technologies. Even if your small business is all set for computers and computer accessories, you may yet need a Virtual Integrated System (VIS) to improve your data center efficiency. Dell has resources such as the PowerEdge C Server line, hyperscale inspired servers that use the least amount of space to provide the most amount of power. If business isn’t the only thing on your mind, you can also browse an affordable selection of electronic accessories, from a Sharp or Sony HDTV to a Canon PowerShot Camera or an UltraSharp monitor. Even geeks sometimes need a little support. This company’s ProSupport has an average phone wait time of less than two minutes, and they offer small business services from asset and data protection to configuration. You can also get IT consulting and outsourcing and managed services.